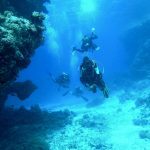 Scuba Diving – Learning a new language! This week has been hot and sunny! Lewis decided to continue his diving education and we went to Alcalà to do his Navigation and Peak Performance Buoyancy. As always he did a good job and we enjoyed looking at the two turtles that lives there. Both very curious! Alcalà is such a good dive site with deep water entry and cool rock formations with vibrant aquatic life! Thursday we were supposed to go for a night dive at Tabaiba, but after a couple of Lewis’s Advanced Dives we realized that it was too much of a surge to dive. We drove over to Abades to see if the conditions were better, but unfortunately to chappy waters there as well. Either way it was a fun road trip, singing in the car and Alan and I had a dance session in the car park. Friday we had a PADI Open Water student. Flounder and I went to the pool with them, and as Randall and Mick did the confines we practiced skills. I’m so glad my skills are improving! And in all the seriousness, it is so much fun! Kit set up and speeches before skills are so hard, it’s like learning a new language. Submersible-pressure-gauge-low-pressure-inflator-hose, tongue-rolling words right there! After work we went to the Americans flat to make tacos and played beer pong! That game is so much fun, and the first run I had beginners luck out of another world! Alan and Steve are leaving us on Tuesday. It’s going to be sad to see them go, and hopefully I will visit them in America at some point! Posted in: Dive and Sea Teneife, PADI Divemaster Intern Blogs, PADI Divemaster Interns. Tagged: Dive and Sea Tenerife, Diving Tenerife, PADI DIvemaster, Tenerife Dive Sites.